(PhysOrg.com) -- For the first time, scientists at IBM Research have demonstrated that a relatively new memory technology, known as phase-change memory (PCM), can reliably store multiple data bits per cell over extended periods of time. This significant improvement advances the development of low-cost, faster and more durable memory applications for consumer devices, including mobile phones and cloud storage, as well as high-performance applications, such as enterprise data storage. With a combination of speed, endurance, non-volatility and density, PCM can enable a paradigm shift for enterprise IT and storage systems within the next five years. Scientists have long been searching for a universal, non-volatile memory technology with far superior performance than flash  todays most ubiquitous non-volatile memory technology. 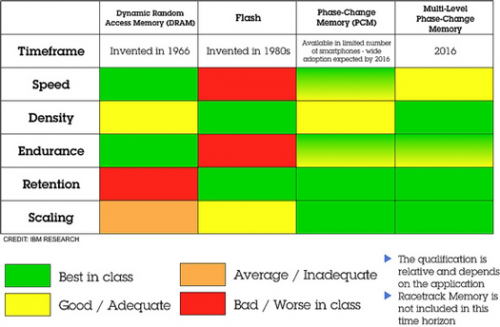 The benefits of such a memory technology would allow computers and servers to boot instantaneously and significantly enhance the overall performance of IT systems. A promising contender is PCM that can write and retrieve data 100 times faster than flash, enable high storage capacities and not lose data when the power is turned off. Unlike flash, PCM is also very durable and can endure at least 10 million write cycles, compared to current enterprise-class flash at 30,000 cycles or consumer-class flash at 3,000 cycles. While 3,000 cycles will out live many consumer devices, 30,000 cycles are orders of magnitude too low to be suitable for enterprise applications (see chart for comparisons). PCM leverages the resistance change that occurs in the material  an alloy of various elements  when it changes its phase from crystalline  featuring low resistance  to amorphous  featuring high resistance  to store data bits. In a PCM cell, where a phase-change material is deposited between a top and a bottom electrode, phase change can controllably be induced by applying voltage or current pulses of different strengths. These heat up the material and when distinct temperature thresholds are reached cause the material to change from crystalline to amorphous or vice versa. In addition, depending on the voltage, more or less material between the electrodes will undergo a phase change, which directly affects the cell's resistance. Scientists exploit that aspect to store not only one bit, but multiple bits per cell. In the present work, IBM scientists used four distinct resistance levels to store the bit combinations 00, 01 10 and 11. To achieve the demonstrated reliability, crucial technical advancements in the read and write process were necessary. The scientists implemented an iterative write process to overcome deviations in the resistance due to inherent variability in the memory cells and the phase-change materials: We apply a voltage pulse based on the deviation from the desired level and then measure the resistance. If the desired level of resistance is not achieved, we apply another voltage pulse and measure again  until we achieve the exact level, explains Pozidis. Despite using the iterative process, the scientists achieved a worst-case write latency of about 10 microseconds, which represents a 100× performance increase over even the most advanced Flash memory on the market today. The PCM research project at IBM Research  Zurich will continue to be studied at the recently opened Binnig and Rohrer Nanotechnology Center. The center, which is jointly operated by IBM and ETH Zurich as part of a strategic partnership in nanosciences, offers a cutting-edge infrastructure, including a large cleanroom for micro- and nanofabrication as well as six noise-free labs, especially shielded laboratories for highly sensitive experiments. In 1966, IBM Fellow, Dr. Robert Dennard invented dynamic random access memory  DRAM  which, when combined with the first low-cost microprocessors, opened the door to small personal computers. Today, every PC, notebook computer, game console and other computing device is loaded with DRAM chips. DRAM also powers mainframes, data center servers and most of the machines that run the Internet. In 1988, Dennard was awarded the US National Medal of Technology for the invention of DRAM. As IBM celebrates its Centennial this year, the company celebrates DRAM as one of its 100 greatest innovations. More information: The paper Drift-tolerant Multilevel Phase-Change Memory by N. Papandreou, H. Pozidis, T. Mittelholzer, G.F. Close, M. Breitwisch, C. Lam and E. Eleftheriou, was recently presented by Haris Pozidis at the 3rd IEEE International Memory Workshop in Monterey, CA.